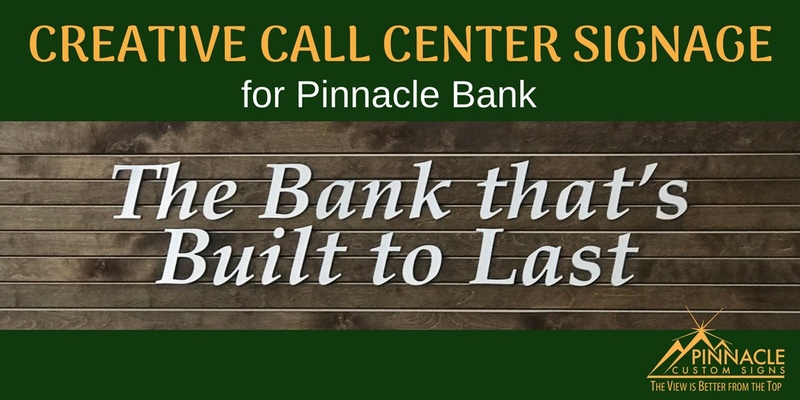 Cristina Culbreth, from Mighty 8th, reached out to Pinnacle Custom Signs at the end of February to talk to us about a new call center Pinnacle Bank was implementing in Athens. The bank was getting ready to implement “interactive” teller machines that would allow customers to drive up to an ATM and speak to a live teller located in this new call center. Because of this, the new facility required some creative thinking to brand them appropriately for these face-to-face interactions. Mighty 8th had been working with Pinnacle Bank on the design for this new facility but needed to touch base with us for a couple suggestions on the technical aspects of the sign installations. Overall, they were looking for a branded backdrop for the representatives’ cubicles, so we had to come up with a way to do this. To complicate things a bit, some of the cubicles would feature “standing desks” so they needed to be a bit taller than those at “sitting” desks. 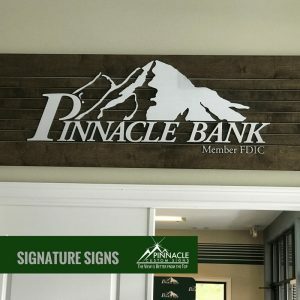 Other signage items needed to complete the job for Pinnacle Bank included: branded art canvases, vinyl graphics on the walls with their values, and two of their “signature signs”. The branded backdrops for Pinnacle Bank presented the biggest challenge for us at the beginning. Our team considered a couple of ways to put graphics into a cubicle. We first ruled out banners. These would be too flimsy, and there was no way to attach them to the cubicle. We next considered using styrene, which is commonly used for trade show backdrops, but could not get it in the width we needed. The next thought was to use cubicle pins but we were concerned with the size of the graphic being too heavy to hold. In addition, the various sizes from sitting to standing desk backdrops made it even more complex in determining the final product. In order to meet the client’s requests for the cubicles and our own standards for durability and longevity, we finally settled on 1/8” PVC. This material came in 5’ x 10’ sheets and was sturdier than the styrene we originally looked to use. We then purchased metal cubicle hooks that would hang over the tops of the cubicle walls. These were attached using VHB (very high bond) double-sided tape. Since they all faced the same way, the part of the hook that went to the next cubicle would be behind the computer monitor and not be seen by customers. 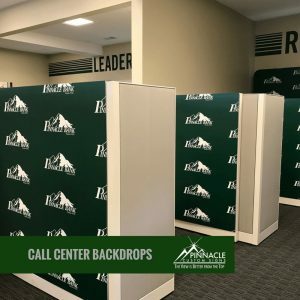 We were able to create the same look for the “standing” cubicles by utilizing 5’ wide by 7½’ tall fabric trade show displays, utilizing the same step & repeat pattern as on the PVC backdrops. The canvas signs we completed for this project showcased Pinnacle Bank’s seven core values along with inspirational quotes to be utilized on wall space throughout the facility. 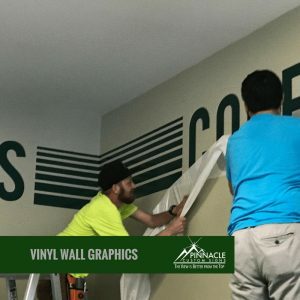 We also created and installed vinyl graphics with those values as wall art along the top spaces above the cubicles around the call center to create inspirational branding from all angles for the employees. In addition, no Pinnacle Bank would be complete without the company’s signature signage. These layered signs are made from wood slats, PVC dimensional graphics, and are completed with a brushed aluminum face. Since we were completing two of these signs to go over two opposite doorways leading to two different parts of the center, one of the signs featured a logo and the other had the tagline. If your company is struggling with how to brand a new concept of layout for your business, give us a call. Our team has experience in how various materials and strategies to find the best solution to making sure your company name is well represented in even non-traditional ways. Give us a call or simply fill out the form for more information.